Our humanity is best, and perhaps only, expressed when we do the unexpected, such as showing compassion to a stranger or, conversely, being unnecessarily cruel and malicious to a friend or family member. London Road focuses on the former, revealing how a random act of kindness can enrich people’s lives beyond any expectation thereof. Although this two-hander focuses on kindness and compassion and is therefore essentially a ‘feel-good’ play, it does not succumb to sentimentality and is not in the least saccharine, it is barely sweet. That is not to say it has not a number of heart-tugging moments – the strings predominantly pulled by the brilliant Robyn Scott who plays the feisty octogenarian Jewish grandmother Rose – but one does not feel manipulated into an emotional reaction. The tears and laughter Scott and Ntombi Makhutshi harvest are pure, partly because it does not moralise and partly because it is firmly set within a recognisable reality. A reality determined not only by the physical location of London Road, Seapoint, but also by the emotional and circumstantial situation of the characters within it. Widowed Rosa, whose children have both emigrated, was probably a member of the communist party back in the day and has spent much of her life volunteering at the union offices and generally trying to improve civic life. Stella is a conscientious young Nigerian woman who makes her living selling party drugs to high-flying businesspeople while her cheating husband is back in Lagos. We know there are women like Rosa and Stella living within metres of each other, not only in Seapoint, but in transitional neighbourhoods the world over. That circumstances bring these two women to forge a friendship is not unlikely, especially given Rosa’s penchant for sticking her nose into other people’s business in a helpful sort of way. Nicholas Spagnoletti’s dialogue is effortlessly natural and Lara Bye’s direction provides transitions so smooth they are barely noticeable, not allowing the audience’s focus to slip for a moment. Scott, a young woman, does an absolutely superb job. Not for a moment do we fail to perceive Rosa as a loveable, unsentimental octogenarian busybody. Simply due to the nature of the roles, Makhutshi’s star is ever-so slightly dimmer but there is no doubt her skill is equally responsible for the illuminating light this play casts on the rich possibilities human relationships hold. 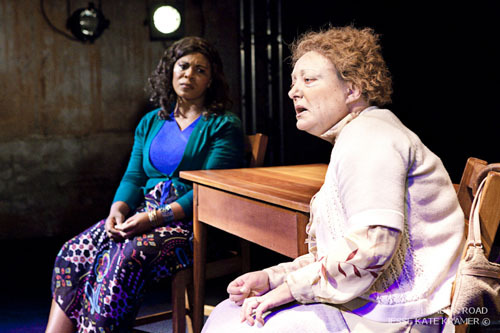 London Road plays at the Fugard Theatre Studio until December 17. Bookings are through Computicket or the box office on 021 461 4554.